The other day I called Telus to cancel my campaign phones and internet service. Groan. After listening to canned music for 17 minutes I was transferred to a customer service rep. He took my information, argued with me when I wouldn’t give him my email address, and finally transferred me to the cancellation department…where I was put on hold. Groan. After listening to canned music for 6 minutes the cancellation rep came on the line. She was a lovely woman who follows politics closely. We had a lively discussion about the recent by-elections and the astounding fact that the PCs were elected in all four ridings. “Why do Albertans continue to vote the PCs into office?” I wondered. “Ah,” she said, “you should check out Tommy Douglas’ Mouseland speech”. So I did. Mouseland is a very short (and humorous) speech that is as relevant today as it was when Tommy Douglas first gave it in 1944. Here’s the link. This is the animated version that’s introduced by Tommy Douglas’ grandson, Kiefer Sutherland. I’ll wait here while you check it out. OK here’s the Cole’s Notes version. Mouseland is a place where all the little mice lived. They had a Parliament and voted every 4 years. 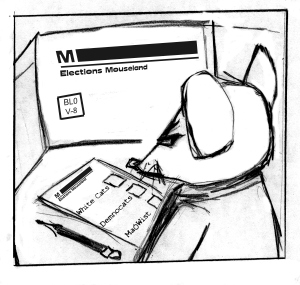 On election day all the little mice would go to the polls and elect a government—a government of made up of big, fat, black cats. The cats passed good laws. Laws that were good for cats; but oh so hard on mice. They made mouseholes big enough for a cat’s paw to fit in and set speed limits on mice so they’d be easier to catch. Life was hard for the mice and they finally decided to do something about it. They voted the black cats out and replaced them with …. white cats (who said things would be different). But things just got harder. So the mice voted the white cats out and put the black cats back in, then they tried half white and half black cats (a coalition). But the trouble wasn’t the colour of the cats, it was that they were cats. And because they were cats, they looked after cats, not mice. Finally a little mouse had an idea…instead of electing a government made up of cats, why don’t we elect a government made up of mice? If you clicked the link you’ll know the joke comes here. Go ahead, check, I’ll wait. Albertans, unlike the little mice, don’t bother voting in different coloured cats. They continue to vote for the same cats wearing different coloured collars. Redford had a red collar. Prentice has a reddish-blue collar. But anyone who has ever owned a cat knows that unless the collar is so tight it almost strangles the cat, he won’t be wearing it for long. Okay, enough about cats and mice. Why do people continue to support conservative governments bent on deregulation, privatization and subsidization of corporations (and the wealthy) at the expense of public education, public healthcare, the frail, the elderly and the poor? This question has bedeviled political scientists for decades. The duping hypothesis: Thomas Frank, author of What’s the Matter with Kansas?, argues that the Right dupes voters into voting against their self-interest by “hooking” them with hot-button social issues like abortion, gun control, and gay marriage and then fanning the flames of a “class divide” (Rob Ford vs latte-drinking effetes). He attributes the remarkable sea change in Kansas politics—the once progressive state voted 80% in favour of George Bush in 2000—to an anti-abortion demonstration held in Wichita in 1990. The Republicans, ever mindful of opportunity, saw hundreds of anti-abortionists chain themselves to cars and lie down in the road and said: while we admire your courage and conviction, we’ve got something a lot smarter for you to do than lying on the highway. And it worked. People who weren’t the least bit “political” jumped at the chance to work with and vote for the Republicans and it snowballed from there. It’s about moral vision, stupid: Jonathan Haidt, author of The Righteous Mind,* says the duping hypothesis is delusional because it lets the Left to absolve itself from blame while avoiding the hard work necessary to develop a successful strategy for the 21st century. Haidt says what’s really going on is this: the Right aligns itself with lofty moral values like patriotism, social order, strong families, free enterprise and rugged individualism (no nanny state for me!) instead of pedestrian government programs. So a vote for the Right is not a vote against one’s self-interest, but rather a vote in favour of one’s moral ideals. Do either of these theories ring true in the Alberta context? Or is Mouseland actually Dreamland—a place where we believe that if we leave well enough alone it will all work out in the end? This entry was posted in Politics and Government and tagged Jim Prentice, Jonathan Haidt, Kiefer Sutherland, Mouseland, Redford, The Righteous Mind, Thomas Frank, Tommy Douglas, What's The Matter With Kansas?. Bookmark the permalink. Susan 17 + 6 = 23 minutes. Not bad for Telus. I am surprised you only waited 23 minutes. Since they implemented the automated systems, which were supposed to offer quicker service, the waiting times are atrocious. On top of that we now get people that think that they have the right to treat you like you should not be calling in the first place. You were lucky that you were not redirected to Costa Rica or India where they have the same fix for every problem – Reboot. People like Tommy Douglas will probably never be in politics for a long time to come. With the destruction of great Liberal Arts programs around the so called ‘First World’ because it just does not get you a job, it is no surprise that we have people that cannot think – they just repeat over and over what their master tell them to. Without any education in Liberal Arts people are less and less capable of understanding what is going on, make their own minds about difficult issues and try to offer suggestions based on fact, experience and wisdom. The extreme right wing wants them to be consumers and vote for them. Thinking? What is that for? The market will resolve our issues better than we can ever imagine. Just look around. It is called in my dictionary, self inflicted stupidity and self destruction. The Islamic fundamentalist world does it with human bombs, we are more sophisticated. We guide them so ever gently into an absurd world without any objectives other than having lots of money, do whatever it takes to be a celebrity to ‘make it’ into the elites, and be a consumer. Carlos, picking up on your last point, we do indeed “guide them so ever gently into an absurd world without any objectives other than having lots of money, do whatever it takes to be a celebrity to ‘make it’ into the elites, and be a consumer”. I’ve had this conversation about voting against one’s self-interest with many people. A friend told me that the progressives are asking people to vote against the American Dream. In the US everyone is a millionaire, some of them just haven’t made it yet. So why would they vote in favour of higher taxes and more support for the less fortunate when they don’t see themselves as belonging to that particular demographic for long. Like I said…Dreamland. And yes, 23 minutes isn’t too bad in the grand scheme of things. I was once on hold with Air Canada for so long I fell asleep and almost lost my place in line when a real person finally came on the line! You can look forward to the excitement of being a senior who waits: 16 months from paper application to receipt of first payment of Guaranteed Income Supplement — that’s the government subsidy for seniors living in poverty. The amount you get is another topic. Several wait times over 45 minsutes with Alberta Health Seniors because they only have one staff person. Most seniors don’t have a speaker phone, so that requires sitting for that time holding the receiver to your ear. Any request or attempt to get information, correct information, report not receiving money etc will require many such calls. Terry I fear things will only get worse now that oil prices have plummeted and the government has even less revenue to spend on health care, education and seniors care. We need to keep the pressure on our MLAs, it’s really all we can do until we get a chance to vote as many of them out of office as possible in 2016 or sooner. Hi Susan. People are petrified of change and trying something new. We’ve become complacent. I remember when Bush (can’t remember whether it was Bush 1 or Bush 2) used fear tactics during his campaign, I couldn’t believe people were falling for it. Whenever his image came on my TV screen hubby would have to change the channel. People would rather stick with the status quo because of fear that the other guy might be worst. C ‘mon, change it up. I hope this makes sense. I’m trying to respond while sitting on a bus. Joanna, the fact that Albertans couldn’t bring themselves to elect even one non-PC politician in the four by-elections proves your point. Albertans said they were steaming mad and were going to send the PCs a message…and yet they replaced all four MLAs with more PCs. They could have elected four Wildrose candidates and not have changed the balance of power one iota. But like the little mice, they fell for Prentice’s “new” message (the party is “under new management”, it needs to earn back the trust of the people, it will be accountable to the electorate, etc, etc, etc). Prentice’s government, just like the Redford government and the Stelmach government before it, is busy taking care of business. The first official act of Stephen Mandel, the health minister, was to enact regulations banning flavoured cigarettes except menthol-flavoured tobacco which scientists say the most effect at luring young people into smoking. Apparently Hal Danchilla, a tobacco lobbyist, had been involved in Mandel and Prentice’s election campaigns. But that’s not it. According to Mandel he needs to do more consultation on menthol before banning it. Funny, when Redford government decided to drop the legal drinking limit to .05 and give itself the power to suspend drivers’ licences for 3 days and impound vehicles, they didn’t see any reason to consult with anyone at all. LOL Susan about Air Canada. It seems that it is everywhere. We made our services like most of the rest of the World. Instead of improving them, we jumped on the Globalization band wagon and transformed great services into what I call ‘You only have a problem if you can wait on the phone for longer than 20 minutes’. As far as Canada I think that we still have a chance to make it to a more common sense position that the one we are now. By the way continuing my propaganda I would like to suggest this video that it is already dated but very worth it. Carlos, your experience with your American co-workers in Prudoe Bay is quite an eye-opener! Firstly, their belief that the residents of a Nordic country would not be allowed to leave is mindbogglingly stupid. Secondly, their failure to understand the relationship between taxation and the government’s ability to deliver social services is a major stumbling block for all progressive parties. The American Dream appears to be based on quantity, not quality. One can demonstrate “quantity” by how much money/credit/debt one can accumulate in order to buy stuff. Quality doesn’t enter into the equation. A citizen’s quality of life is reflected in his ability to access quality education and quality healthcare so that he can maximize his full potential. A citizen’s ability to care for the frail, elderly and those less fortunate allows others to maximize theirs. Only the well-to-do in the US have “quality” as well as “quantity”. Sadly those who expect to join the millionaires club any day now just don’t seem to understand that. PS Thanks for the link. I look forward to watching it. thanks so much for this Susan – what a treat to hear Tommy Douglas’s own telling of his charming – and all too true story. You’re welcome Susan. Tommy Douglas illustrated the problem very well. I wish he’d set out a way for the mice to agree on just one mouse to represent them so that we could stop the vote-splitting problem. We’re going to have to get to this solution sooner rather than later if we hope to put more progressive MLAs and MPs into office. Tommy didn’t go on to talk about spotted or striped cats… how does that chapter unfold? Carol: it unfolds as you’d expect, the spotted and striped cats talk a better line–“we’re under new management” is their new slogan–but in the end it’s the same old thing. Oil prices are down and we (who?) need to exercise “caution” and “find new efficiencies in government” in order to balance the budget. Funnily enough, when WR candidate John Fletcher said the WR would pay for schools and hospitals by eliminating “waste” in the system, Gord Dirks, the newly elected education minister, said if the WR expected to balance the budget by eliminating waste they were in “financial fairyland”. And yet, here we are, in PC financial fairyland “looking at different efficiencies throughout the government of Alberta…to make sure that we have a blananced budget moving forward” (Finance Minister Robin Campbell in the Herald Nov 19, 2014 A4). Another insightful and thoughtful brief and excellent public commentary- thankyou! I wonder what Rev. Tommy or Dr Haidt would say about the 1000 students at MRU, many of whom had the opportunity to vote for the first time, on the main floor of their west residence and chose not to. While we would all benefit from a proper study of these young people my assumption is that a third reason for voting against one’s self-interest (in this case, not voting at all!) is the deep (unconscious?) belief – especially after 43 years in a one-party state – that their opinion will not make a difference. This attitude of powerlessness, not far from despair, should be a strong call to re-commit ourselves to revive Alberta’s democracy. David I could not agree more on the attitude of powerlessness that you mention. It really does not surprise me, I just have to look at my frustration trying to stay with the absurd that is going on in our society. What really amazes me is the study after study and the question after question on radio, TV and Facebook and whatever else we use these days, questioning why? Why is our young people so distant from political/social issues? The question should be why are we trying to con young people into accepting the garbage we have created. I do no believe for a second that politicians and some academics do not know the real reason. This attitude of surprise is in itself part of the total disconnection from real democratic values and in the case of some politicians, it is total dishonesty and lack of ethics. The so called Progressive parties in Alberta are not any better. Their inability to work together for the benefit of the public is mind boggling. They are incapable of putting aside their egos in order to save this province from total ruin. David and Carlos: you raise two vexing questions. Why don’t the young vote? They say it’s because we don’t talk to them about issues that interest them. So David and I went to where they live (literally). We knocked on hundreds of doors at Mount Royal University and talked to the students about out of control tuition fees–and yet only a handful came out on election day. While it was good to see 300 students stage a protest on the steps of the Legislature on Monday, a vote for change would have been much more effective. Powerlessness? What difference does it make? This is something I heard on the doors. It came out as cynicism and distrust of anyone in politics and frustration with all the progressive candidates because they couldn’t find a way to merge or at the very least cooperate in order to stop vote splitting, If we could solve the second concern by finding a way to speak with ONE progressive voice we’d be able to put progressives into government and demonstrate that not all politicians are in it for themselves. This is a huge challenge. Judy, as oil prices continue to hover in the low $70 range I wonder whether Alberta is on the cusp of an era where enough people suffer (to use the words of the economist) to allow class consciousness to emerge. With all his talk about this not being “business as usual” Prentice is making it clear that bad times are just around the corner. Given that Ralph and his successors already burned the furniture, there’s not much more left, is there. Could not agree more Judy. The Liberals, the NDP and the Alberta Party would do exactly the same thing these guys are doing. They are in for themselves not for the province and its people. Any real democrat understands this with his/her eyes closed. The problem is that we have lost the sense of democracy and so the situation becomes a crisis and the paralysis we are already witnessing everywhere. There is no real difference between the parties because once they get there they just do not have any resilience to do what they preach and the reason being that deeply inside they are all the same. Power, money, prestige, elitism and nothing else. Carlos, while I’d agree that many politicians, particularly those who’ve been in power for a long time, are corrupt. I’ve had the privilege of getting to know a handful who are doing it because they actually care about democracy and improving the quality of life for those they represent. The PC government fired Dr David Swann from his job as a public health officer for daring to speak out in favour of the Kyoto Protocol. It was only then that David entered politics. He felt strongly that the government should not be allowed to interfere with freedom of speech. Earlier this week when David responded to the Throne Speech in the Leg, he made a number of good points including the comment that if the PC government truly wanted to do the right thing it would move to proportional representation. The difficulty these “good” politicians face is that they’re powerless to make meaningful change when confronted by a corrupt majority government elected under a “first past the post” system. The fact that the majority of citizens think politics is boring, irrelevant and a waste of time only perpetuates this broken system. Susan I fully agree with you and I know well what David has done and I know that generalizing is obviously wrong. On the other hand I ask the question ‘When was the last time you remember a decent politician in a position of being able to make a difference?’ – The last one I remember with any connection whatsoever with the citizens of this province and obvious crook was Peter Lougheed. So if that is the case, then we have to ask a second question – How can we ever accomplish anything with this kind of government – 1 in half century? So then we come to the final question – What kind of system brings about this degree of failure and how do we fix this situation? Well I can at least answer this last question – This is an anti-democratic system that works for the very few. I know that some people reading this or other comments I made can think ‘Well why don’t you run and fix it?’ – I can answer that one as well. I do not think this system is fixable. The vested interests and the controls are just too entrenched for a possible change. This is the reason why we are stuck. I apologize for the mistake – I just realized this morning that instead of having ‘ Peter Lougheed ,…. and obviously not a crook…’ I, after a stupid editing left exactly what I did not mean. I deeply apologize for this. Sometimes these things happen. “You loaded sixteen tons and what do you get? And yes, our existing political system is tilted in favour of the status quo, but unlike the coal miner Albertans do have a choice. For some reason they’re too complacent (or afraid) to take it. I never did trust cats…..
GoinFawr: great cartoon but the mice have to get a whole lot smarter if they expect to come out ahead! PS I couldn’t get your first T Douglas cartoon to come up, can you re-send? Jim, neither did I, with good reason, they have claws and aren’t afraid to use them. I must admit I do not know enough about politics to participate in a political debate but I am smart enough to figure out that “better the enemy you know” than the “enemy you don’t” is stupid. Unfortunately people seem to go with the first. I am just going to cross my fingers and hope that people will eventually learn and decide that change is good. Rose: I couldn’t agree more!! !